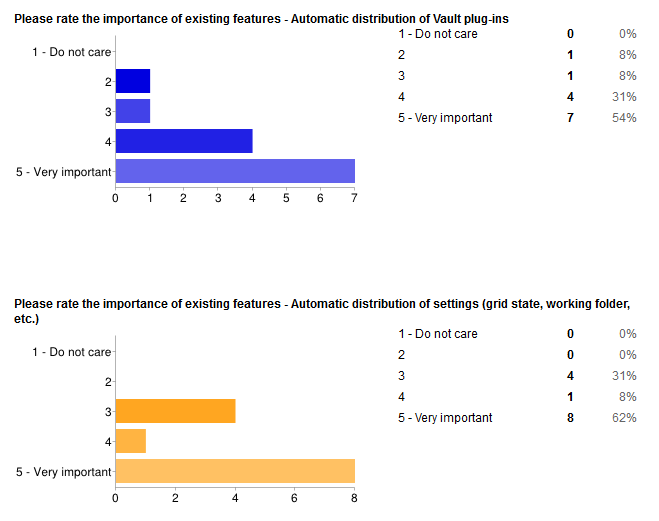 A while back I did a custom object survey, and it turned out pretty well. It was a nice, quick way to get feedback. So expect more of these mini-surveys. My next app will be an update of Project Thunderdome for Vault 2013. I’d like to get some feedback on what I should focus on. So please take my mini-survey if you have an interest in this app. Thanks. UPDATE: The survey is now closed. 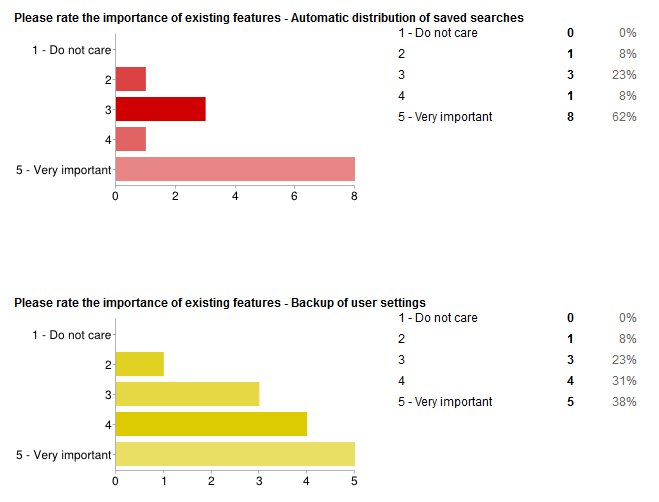 Here are the results if you are interested. 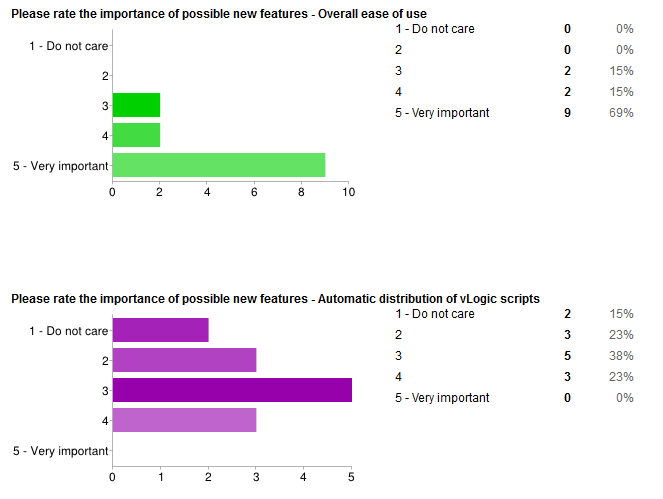 It's pretty much what I expected, but I'm a bit sad that vLogic didn't get any 5's. Update: The Vault 2014 version of DECO is now available. Take one last good look at yourself in the mirror...because I’m about to rock your face off. Introducing Deco, the Design Editor for Custom Objects. Deco lets you define your own custom object UI without the need for custom code. Deco allows you to define your own dialog when creating a new custom object. It allows you to define your own edit dialog. And it allows you to have a custom tab for viewing your custom object data. Deco can’t do everything, however. Complex UI will still need custom programming. 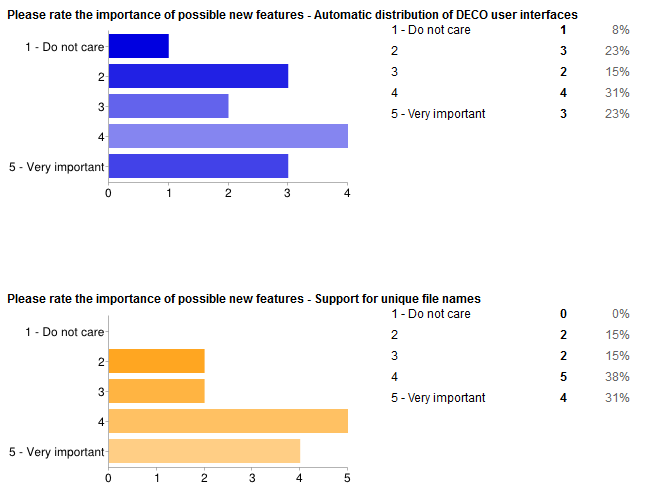 But Deco should hit most of the common cases. Specifically “property page” type functionality, where you want to display or edit the properties on a single object. It’s probably best if you watch the how-to video on my Youtube channel. In other news, I now have a Youtube channel. There is not much up there right now, but I’ll be porting over most of the videos from this blog. Custom Objects only. No support for files, folders, items, and so on. 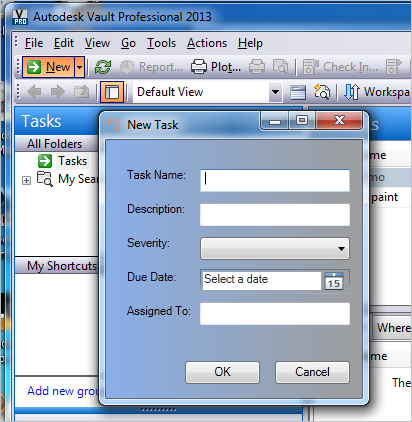 Vault Professional 2013 only, since that’s the only product with custom objects. Vault data can only be hooked to TextBox, CheckBox, ComboBox an DatePicker controls. The XAML files and Settings.xml need to be distributed to all clients in order for them to see the custom UI. This issue will be addressed in the next release of Project Thunderdome. I can’t believe I forgot to add this to the “What’s New” page in the SDK documentation. 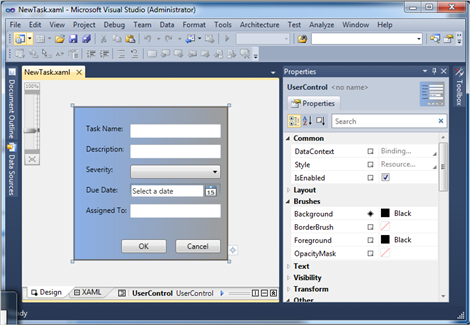 New in the Vault 2013 API, you have the ability to jump to a different location when you custom command completes. This is a useful feature if, for example, your command creates a folder and you want the user to navigate there. To enable this feature, you just need to set GoToLocation property on the ICommandContext object that gets passed into your custom command. It works similar to ForceRefresh. You set the value somewhere in your custom command, and Vault Explorer performs additional actions when your command completes. And yes, you can use GoToLocation and ForceRefresh together. The refresh happens first, then the location jump happens next. To set GoToLocation, you need to set up a new LocationContext object. That object has 2 parts to it. One part is the SelectionTypeId, which is basically the type of object we are navigating to. The other part is the FullName, or path, to the object. Because we are dealing with navigation tree locations, the currency is names and paths instead of IDs. What you put for FullName is dependent on the object type. Here is a table that explains the values. New to Vault 2013 is the ability to compress data when uploading or downloading files. By default, file data is uncompressed, just like it has been in previous releases. This article will show you how to enable the compression feature so that you can see performance gains when transferring large amounts of file data. LZ4 is only compression algorithm that Vault supports. We looked into ZIP, but it was too slow. The time it took to zip and unzip offset the time we saved with smaller network traffic. So we decided on LZ4 because it was much quicker. If you have a slow network or do a lot of file transfer, you will definitely want to enable this feature. Even if you do small amounts of file transfer, it doesn’t hurt to turn the feature on. The steps to enable compression in Vault are pretty easy. First, you create a CompressionHeader for your DocumentService. Next you transfer the data and do the compression or decompression. It’s best if I just show the source code. The ByteArray class will make much more sense. NOTE: You will need to get an LZ4 library for the compression and decompression. Here is one such library. // Downloads a file and uncompresses it. // Returns the uncompressed file bytes.
' Downloads a file and uncompresses it.
' Returns the uncompressed file bytes. If you have a large file which needs to be transferred in multiple parts, each part gets compressed/decompressed independently. For example, if a file requires you to call DownloadFilePart twice, you would run LZ4 decompression twice. You would download the first part, decompress it, download the second part, decompress the second part, then combine the two decompressed byte arrays. My friends over at coolOrange have come out with a blog of their own. It’s still young, but there are already some good articles up there, especially if you are a PowerShell fan. Blogs are mainly fueled by active readership. So if you want more articles (and I know I do), then make sure to let them know. For the first time ever, I’ll be copying an article from the SDK to my blog. Usually it goes on my blog first before going into the knowledge base. Anyway, most of you probably didn’t notice the new knowledge base article titled “Extension Loading Error Logging” in the Vault 2013 SDK. My colleague, Dan Dulzo, wrote the article after adding a feature that lets you log the load errors for any of your Vault extensions. Sometimes, Vault extensions are loaded into environments without a GUI, such as an event handler. Unfortunately, if the extension fails to load due to errors, it will fail silently. As an SDK programmer, this can cause confusion when trying to develop and deploy an extension. Fortunately, the SDK can be configured to log these errors, allowing developers to see (and hopefully fix) what went wrong when loading an extension. To enable logging, deploy an xml file named ExtensionLogConfig.xml to the same directory that extensions are deployed to (ex. C:\Program Data\Autodesk\Vault 2013\Extensions). Upon loading an extension, this directory is checked for the configuration file, and if it is found, logging is enabled. The ExtensionLogConfig.xml file has a pretty simple format. An example can be seen below. The BaseFileName element specifies the location of the output log file, as well as the base file name of the file. The DateFormat element tells the logger the how to format the date when appending it to the log file name. The KeepLogsFor sets the number of days to keep log files for. The logger will attempt to automatically delete log files with a date older than the specified number of days. Using a value of -1 will cause the logger to delete any previous log information each time an extension attempts to load. Finally, the FileExtension element is used to specify the file extension to use for the log files. Note: If there are no extensions to load, logging will not be performed regardless of any configuration file. Also, if the configuration file cannot be read due to being malformed or any other reason, logging will not be enabled. The logger will write out what extensions load successfully and various error messages for extensions that failed to load. Most errors will result in a descriptive message getting written to the error log. Problems, such as having incorrect assembly attributes or missing a public contractor for your extension class, should be easy to identify when reading the log. Unfortunately, the logger will not be able to provide a useful message in certain situations when the extension loader doesn't know enough about why an extension failed to load. In these cases, the log will contain a generic message resembling "Could not load file or assembly..." or sometimes no message at all. Below are some descriptions of common problems and likely solutions to a few situations where the logger will be unable to provide specific information about why an extension failed to load. If an extension is failing to load and there is no log file being created, double-check that your ExtensionLogConfig.xml file is properly formatted xml. Ensure that the configuration file has appropriate values for all of the configuration settings, i.e. the complete file name is valid, DateFormat is an appropriate date format string, Vault has permission to create files in the directory specified in BaseFileName, etc. Next, check that the ExtensionLogConfig.xml has been deployed to the correct directory. A common mistake here is deploying an ExtensionLogConfig.xml file to each extension's directory. There should be only one configuration file and it should be deployed to the Extensions directory(C:\Program Data\Autodesk\Vault 2013\Extensions\ExtensionLogConfig.xml), NOT to a specific extension's directory (C:\Program Data\Autodesk\Vault 2013\Extensions\[Some Extension's Name]\ExtensionLogConfig.xml). Finally, check to make sure at least one extension is configured to load because no log file is created if there will be nothing to log. The log file will always output messages for extensions that successfully load and extensions that try to load. If there are no message of an extension in the log file, it essentially means that Vault is unaware of the extension, and in fact, didn't even try to load it. The key thing to check in this situation is the .vcet.config file that is supposed to be deployed along with each extension. Make sure this file has the right name, is well formed, contains all the necessary information about the extension, and is in the correct directory. It's important to remember that the .vcet.config file is what lets Vault know of each extension to load. Another issue to check is that all extension files are deployed to the correct directory as well. Problem 3: The log contains the vague error message of "Could not load file or assembly..."
For whatever reason, the extension loader could not load some sort of file or assembly referenced by an extension. The most common root cause of this message is that something is missing. Usually, the first thing to check is that all assemblies referenced by an extension are deployed along-side it (unless they are available in the GAC). Please note that certain SDK assemblies referenced by an extension do not need to be deployed with each extension because they are already loaded by Vault. Another possible cause is that the failed extension references the wrong version of the SDK assemblies, so be sure to check this as well.